Unlike a lot of wildlife books, that seem to primarily concentrate just on our feathered friends, Bradbury explains how to look out and care for even the less popular or attractive – but none the less important – inhabitants that help your garden to grow. The best part of this book are the ‘how to’ guides, which show you how to create bumblebee nesters, hedgehog boxes and even space saving green roofs, amongst other ideas. These are great activities to work on for anyone, but especially those who may have children. The instructions are very easy to follow and each of the stages are accompanied with clear, visually informative photographs that you are able to check your progress against. 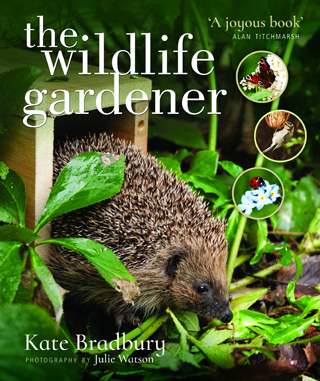 There really is something to make in this book for any type of garden, large or small, so everyone should be able to create a little wildlife haven, regardless of space. The information doesn’t stop there. The Wildlife Gardener also offers an informative, yet concise guide to help you identify what is already in your garden and how to look after and attract other creatures that you may wish to see more of. Last but not least, this book also offers you tips and advice, in a handy trouble shooter, which can offer remedies and explanations to any problems or issues that you might encounter . these could be what to do if you find a bat on the ground, or what to do if two foxes are stuck together after a mating session in your garden! Wildlife really is weird and wonderful and it is all covered in here. Practical, relevant and realistic, The Wildlife Gardener can offer any gardener, from novices to the more experienced, a lesson in helping the wildlife population and their own green environments. The book is simple to follow and has clearly been written with passion and love for the subject, all of which makes for very compulsive reading indeed.